It's raining once again, and what better way to bask in the cool weather than to curl up in a couch with a book in tow, a mug of hot chocolate and a couple of sweet doughnuts? The gentle pitter patter of the rain paints a backdrop as I type furiously away in my computer, eager to finish as much work as possible. A draft of cool air brushes against my back, and I shiver slightly. A pause mid-air preludes a faint rumbling in my stomach. It's four in the afternoon, and I'm ready for a snack. I hanker for something sweet and I remember half a dozen round confections secured in a white box splattered with a pattern of tiny green dots; the other box's contents a mere sweet memory from the night before. I nestle snugly in the couch, my back against a plump pillow. I hold my book open with one hand, the other fleeting above each delicacy, undecided what to get first. 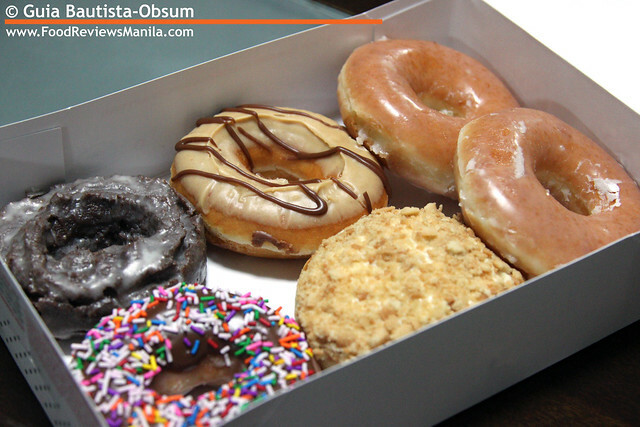 At times I would opt for the flavored ones like Peanut Butter and Kreme. I'm currently engaged in a love affair with peanut butter and so I delight in its light tone featured here, with a thin drizzle of chocolate syrup for that added sweetness. I gingerly hold the New York Cheesecake between my forefinger and thumb, and take a generous sumptuous bite. A gush of cream cheese floods my palate as bits of graham cracker crunch stick deliciously at the corners of my mouth. Saccharine sweet best describes it, yet the cream cheese has a certain tang that squelches any signs of cloying taste. I take a couple of bites from the Chocolate Iced with Sprinkles, but stop myself from finishing it lest my daughter would not forgive me for consuming her share. The veneer of chocolate coated with sprinkles is definitely eye catching and attractive enough to warrant a war between mother and child. The Glazed Chocolate Cake I skip as I'm not really fond of those fudgy, chocolatey brownies or bars, cakes or be it doughnuts. The dense consistency is enough to make me choke and I could never eat big amounts of chocolates without something to cut through its treacly trait. I stare at the last variant, a thin glaze enveloping this revered halo. 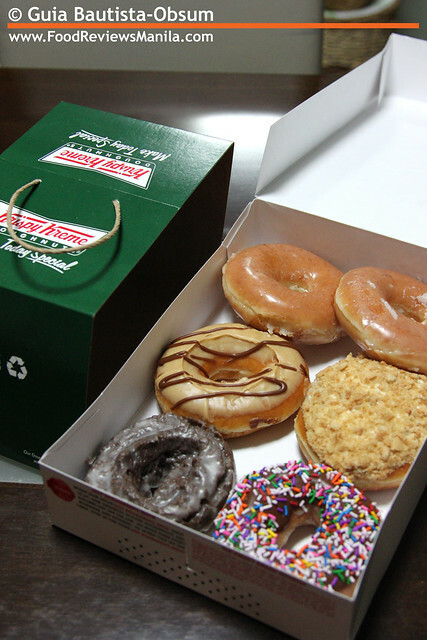 It seems I always find myself magnetized to the Krispy Kreme original, aptly named the Amazing Glaze. I think they call it Original Glazed now, though I say the former title suits it better. There's something about it that leaves you yearning for more. There's a certain balance achieved as the dough rounds out the sweetness of the glaze; but what makes it more gratifying is the pillowy softness and the yielding tenderness of the fried yet light and airy dough. It's comforting, and just what I needed to conclude my hour of recluse. I pat my fingers as shards of hardened glaze fall upon my plate, I sip the last few drops of cocoa from my mug, I close my book but not before I etch the page number where I stopped, into my brain. I relocate to my computer chair and glance out the window. The clement rain has finally stopped, and with it, my cravings. i alternate KK with DD. depends on my want for a sugar rush. hahaha. KK is way sweeter kasi than DD, but both are love. 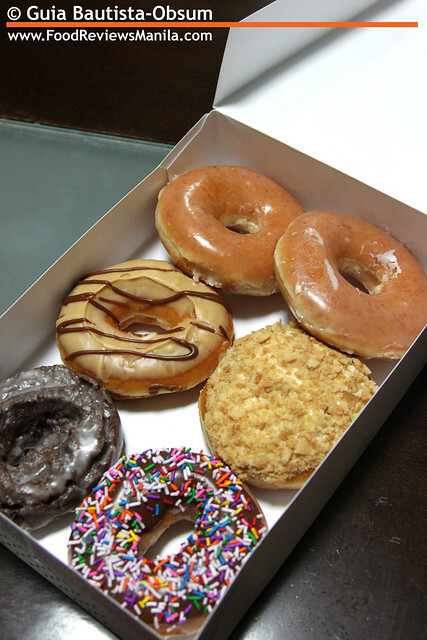 with KK, i usually order lnag the Amazing Glaze. but with DD, i like their specialty doughnuts. both go so well with coffee! strong brewed coffee! The creamy ones are absolutely delicious!!! Welcome to the Kanin Club!